When my online writers’ group, the Guppy chapter of Sisters in Crime, announced a short-story contest for publication in their anthology, I knew I wanted to base my entry on my historical series, which takes place in 4th-century Rome. Because the group is called “Guppies” (for Great UnPublished, though that is no longer true for several members of our pond), it was decided each story must include a body of water that could support fish. I was glad the contest had a theme so that I didn’t have to come up with a plot ex nilho. The water/fish theme presented several possibilities that I bounced around in my head: the Tiber and its occasional floods, boats, fishing. But none of these lit that necessary spark. It was only when I recalled one of Hans Christian Andersen’s stories, “The Tin Soldier,” that the idea of having a vital clue swallowed by a fish came to me. My main character, Marcellina (known in the novels by her nickname, “Cellina”) has a cat. Cats like to eat fish. The family was wealthy; they owned a big house with an atrium and an impluvium, the little pool set in the middle of the atrium’s floor to catch rainwater from the opening in the roof. 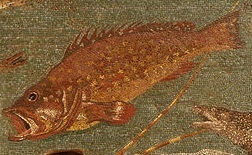 Fish were a big hobby for wealthy Romans, and though the anecdotes I used come from earlier centuries, Rome was a conservative society and I thought it a good bet that wealthy Romans of the 4th century still enjoyed buying and raising fish as much as Cicero’s generation did. Beginning with a rather detailed description of Cellina’s cat, Sagitta (the name means “arrow”), spitting up the fish she’d just snatched from the impluvium appealed to me. Humor isn’t always easy for me to write, but I hoped this scene would make the reader smile. Many of the scenes in my novels take place in ancient Rome’s counterpart to the mall, Trajan’s Forum. The top floor of this multi-story complex was occupied by fish ponds, fed from the great aqueducts, so it was a natural setting for the first step in Cellina’s investigation. It occurred to me that it would be even more interesting if I wrote the scene as Cellina’s first-ever visit. This necessitated writing about a younger Cellina, which proved an enjoyable experience. I hope it is for the reader as well.